In response to CAMERA's communication with editors, a correction appears in today's International New York Times print edition. See below for correction details. 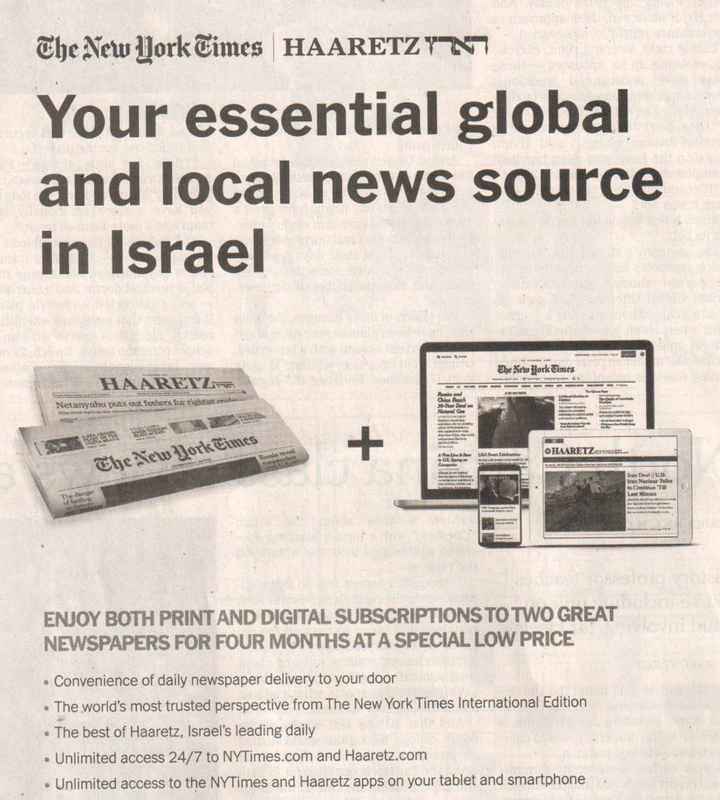 When it comes to New York Times coverage of Israel, literally anything goes. 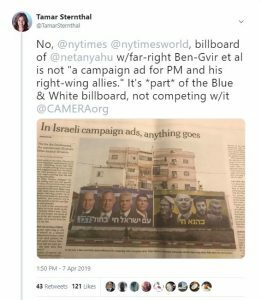 The latest case in point is yesterday's completely bogus caption about an Israeli election billboard alongside an article meant to explain the various campaign commercials in the close and heated race. 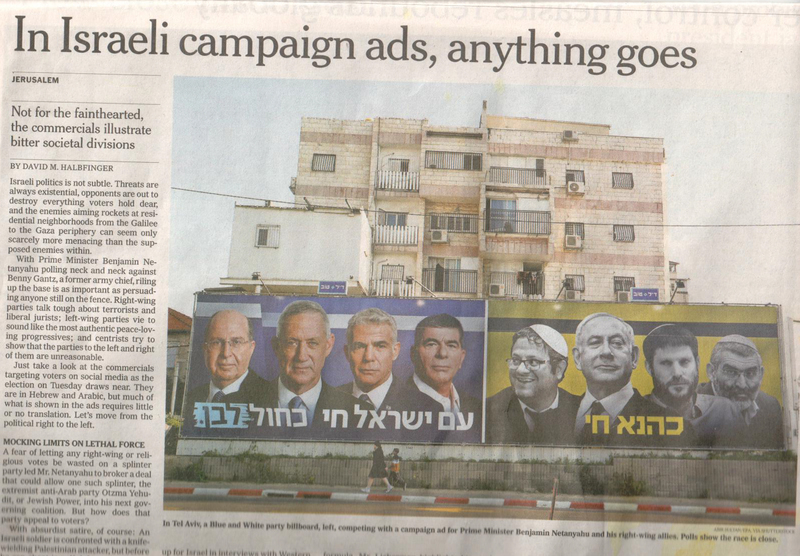 It sits below a four-column, top of the page color photograph of a billboard depicting, on the left side, the leadership of the challenging Blue and White party, from left: Moshe "Boogie" Yaalon, Benny Gantz, Yair Lapid and Gabi Ashkenazi. All but Lapid are former army chiefs; Lapid is a former finance minister. 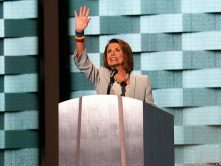 Their images are framed in blue and white and the slogan underneath states in white, "The nation of Israel lives" alongside and the name of the party, "Blue and White." Immediately to the right are four more figures framed in yellow and gray. They are (from left) Itamar Ben-Gvir of the far-right Otzma Yehudit (Jewish Power) party, Prime Minister Benjamin Netanyahu, Betzalel Smotrich of the right-wing Jewish Home party, and Jewish Power's Michael Ben Ari, whom the Supreme Court banned from running in the elections on the grounds of anti-Arab incitement. The slogan below these four men, in yellow, states, "Kahana Lives," the rallying cry of the outlawed, extremist Kach party, banned from the Knesset in 1988 for inciting racism. 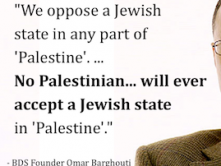 Israeli politics is not subtle. … Just take a look at the commercials targeting voters on social media as the election on Tuesday draws near. They are in Hebrew and Arabic, but much of what is shown in the ads requires little or no translation. Actually, it seems the confounded New York Times editors were in sore need of translators to decode the not so subtle billboard. For starters, the photograph shows just one billboard, and not, as the caption falsely claims, two competing ads. 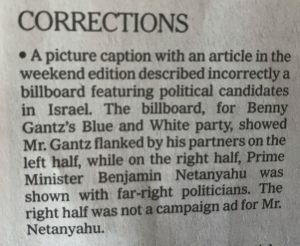 As is readily apparent to any Israeli observer, and as should be apparent to Times journalists tasked with explaining the elections to outsiders, the ad for Gantz's Blue and White paints the Prime Minister as a close ally of the extremist Jewish Power politicians known for anti-Arab racism. 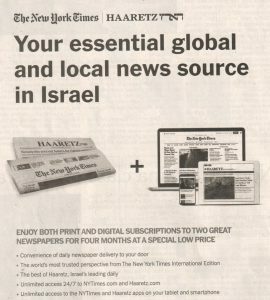 The ad points to a merger between the right-wing Jewish Home and the more extreme Jewish Power which the Prime Minister facilitated. 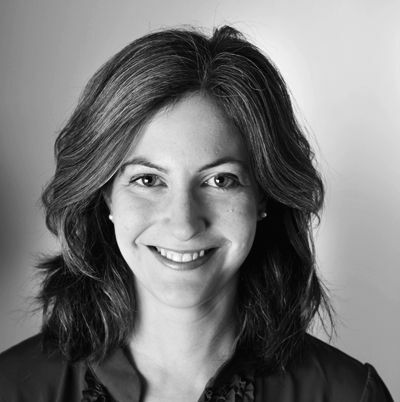 The New York Times promises its readers "the world's most trusted perspective." Yet the complete misreading of a rather blatant political ad exposes, once again, the paper's failure to deliver factual reporting. Indeed, it's been a rough few weeks for the paper's credibility when it comes to trusted news about Israel. 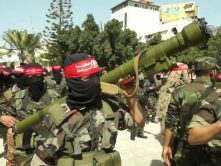 On the news side, editors refused to correct both the false report that a Pew survey found that nearly half of Israeli Jews favor expelling all Palestinians and the completely unfounded claim that "most of Jaffa's Arab residents were forcibly expelled from their homes" in 1948. 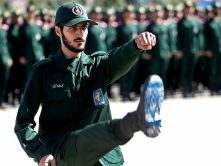 The Opinions section is also doing its share to erode "the world's most trusted perspective," with, for example, a page-one Op-Ed in the International Edition ("In Israel, a so-called democracy") calling Israeli democracy into question, following closely on the heels of the anti-Israel counter-factual screed by Nathan Thrall last week. A picture captions with an article in the weekend edition described incorrectly a billboard featuring political candidates in Israel. 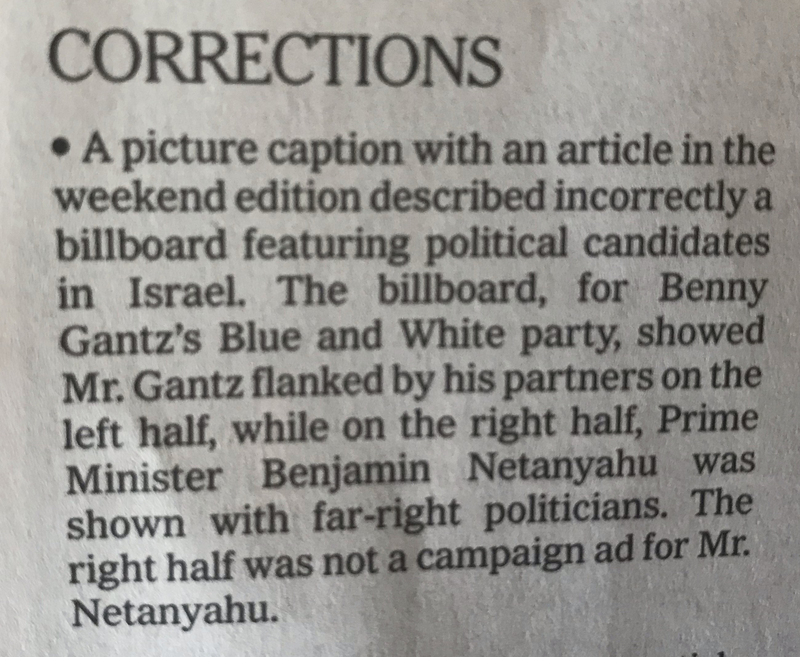 The billboard, for Benny Gantz's Blue and White party, showed Mr. Gantz flanked by his partners on the left half, while on the right half, Prime Minister Benjamin Netanyahu was shown with far-right politicians. 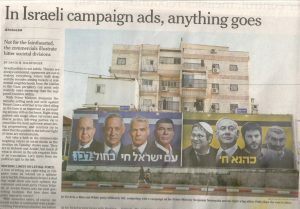 The right half was not a campaign ad for Mr. Netanyahu. 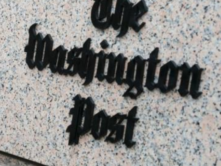 CAMERA commends The Times for the forthright correction.